Best friends – tea and biscotti. Everyone I know is heaving a sigh of relief. Why? Didn’t you hear, spring is finally here! After a long and extremely bitter winter, life is, literally, springing up. The birds are chirping, ducks and geese are waddling and squirrels and rabbits are once again foraging in gardens and scurrying across backyard decks (at least mine). This has to be the best time of the year, not too cold, nor too hot. 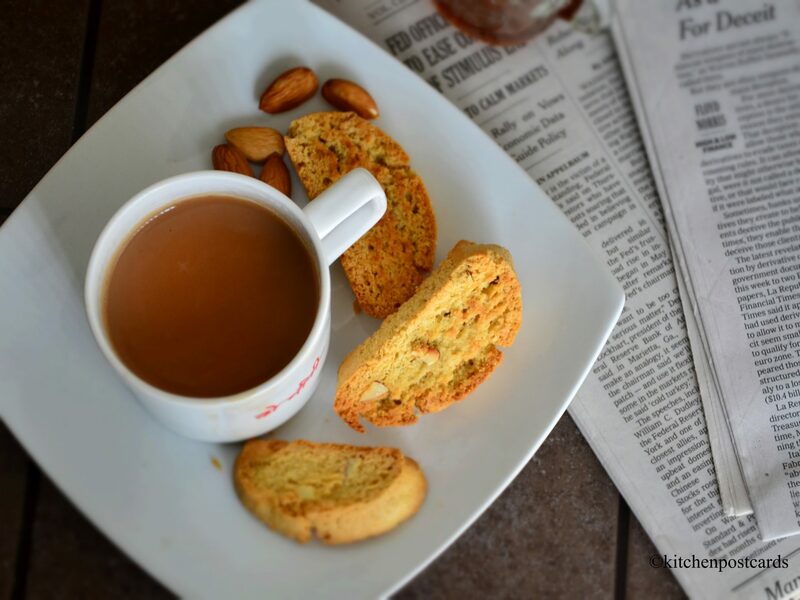 As mother earth rises from slumber and the greenery spreads, I have been busy making my morning cup of tea a little gourmet with the company of almond biscotti baked at home. Yes, biscotti can be baked by you in your kitchen to perfection. You will need some time and patience. Don’t fret later that you weren’t warned! I think Sakshi’s heavenly besan ka halwa is a tough act to follow! I am going to try and demystify the process of making this snack. Biscotti are twice baked, crisp cookies from Italy. The staples of most baked goods remain constant: flour, sugar, butter/fat, eggs, flavour (vanilla or almond essence), salt and raising agents like baking powder. The biscotti are no different, except here I also use brandy and almond milk. Prep time: 1 1/2 hours, active: 45 minutes. 1/4 cup almonds, toasted & chopped. Baking follows two simple rules. First, collect all your supplies. Second, process the flour with salt and baking powder separately from eggs, oil and sugar. 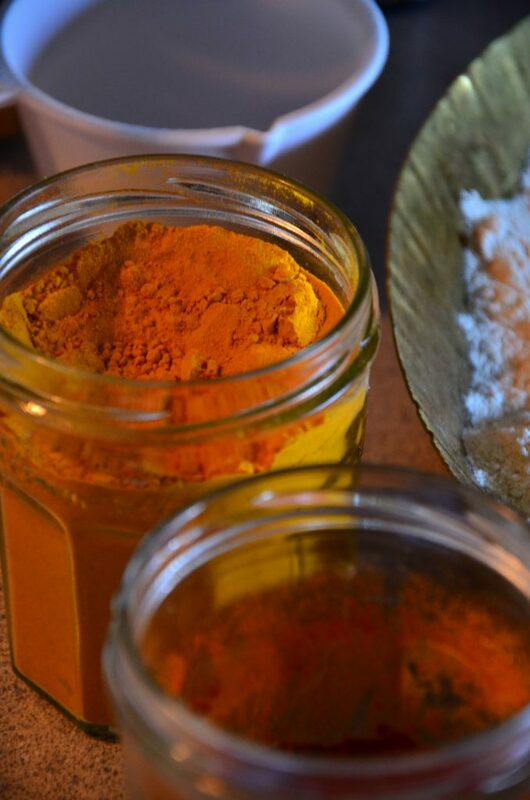 If you can remember this, you will have no trouble organizing your ingredients and workspace for any baking project. First, in a bowl measure flour. I used 2 cups of whole wheat flour and a 3/4th cup of all-purpose flour. To this add salt and baking powder, fluff and mix with a fork and then sift. I don’t always sift. The idea of sifting is twofold, first to mix everything rigorously and secondly, to remove any impurities like chaff that might have mixed in when the grain was ground. In a mixing bowl add oil or melted butter. I usually use canola oil for baking too. You can use equal parts canola and olive oil. To this add sugar and beat together. This is called creaming. With oil, especially since the quantity of oil is less than a cake recipe, the creaming process will result in moist clumps of sugar. Not to worry. Toast almonds, cool and chop roughly. Keep aside. I toast them in the small oven-toaster-grill and don’t mind giving them a little roast. But toast light or dark, to your liking. To the creamed sugar add eggs, one at a time, beating after each. Once done, add the rest of the wet ingredients, i.e. vanilla essence, brandy and almond milk. I chanced upon the idea of using almond milk simply because I did not have almond essence. Frankly, with a picky eater in the house, I did not want to overpower the biscotti with almond. So, almond milk offered a good compromise. If you have neither, almond milk or essence, just add milk. Now comes the crucial step of mixing flour into the wet ingredients. If you have a stand mixer or a food processor, you can process the dough there. I use my hand power! I find a dinner fork, a strong one, to be a useful tool. Like the dough hook, it is almost a single blade (almost) with a slim profile. This prevents too much dough from sticking to it, unlike a whisk. Add flour to the egg mix in four parts, mixing vigorously after each addition. The dough will quickly thicken and become a sticky, gooey lump. Cover the bowl with cling wrap and refrigerate for 30 minutes. The rest and cold temperature will make it easier to handle it. There is science to how gluten works and relaxes letting air escape from the dough. While you wait, get your oven ready. Preheat at 350 F. Keep a baking sheet ready. Take out the cold dough and handle it quickly. If it still sticks to your hands, lightly oil your fingers. Divide into two equal portions and shape into two logs. Roll the balls and stretch them. I place them in the baking tray and then stretch them to form logs. You can lightly dust your work area with dry flour to avoid the dough sticking to it. Bake for half an hour, 30 minutes, until a light, golden brown and a little cracked. Take a break, cool down and slice the loaves. Remove from oven. Use two spatulas to lift the logs onto cooling racks. I have often cut them in the middle to ease the handling. Cool for 10-15 minutes. Then, with a serrated knife, such as a bread knife, cut into 1/4 inch thick slices. Return to the baking sheet and bake for another 10-15 minutes. I like them a medium brown, not too light nor too dark. In this portion of baking you will be able to smell the almonds. A second bake later, ready to eat with a cup of tea! That’s it! They are ready to be tested. Don’t burn your finger, give them a short rest on a wire rack before serving. In our household, they are eaten straight out of the oven! Thepla – a perfect snack, anytime! Follow us on Instagram, Facebook and Twitter for more delicious recipes.